The Mucha Museum (Muchovo Muzeum) in Prague is dedicated to the life and works of the great Czech Art Nouveau artist, Alphonse Mucha (1860-1939). Mucha is famous for the posters he designed for the theatre productions of the great fin-de-siècle actress, Sarah Bernhardt. Mucha's work optimises the Art Nouveau movement. 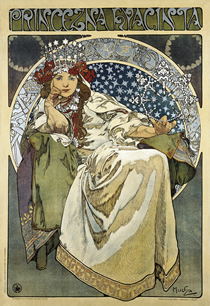 The collection at the Mucha Museum includes paintings, posters, sketches, statues and photographs by the artist, and also features Mucha's lesser known works celebrating pan-Slavism. The museum shop offers an exclusive selection of gifts with Alphonse Mucha motifs.